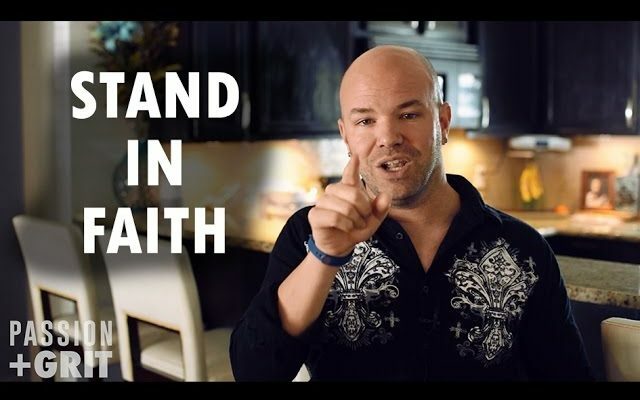 No Plan B – Stand in faith until you succeed! Home / Blog / No Plan B – Stand in faith until you succeed! Hey, what’s up, all you passionate people? Welcome to another edition of Passion and Grit. For those of you that don’t know, we just came back from three weeks solid of my son being in ICU at Arnold Palmer and I want to address something that happened during that time. We made a few videos, we posted a lot, some people may look at us funny for bringing so many people along that journey, but I thought I was important. I think it’s very vital for us to see that miracles are still happening. Listen, if you’re not a faith filled person, you’re not a religious person, hear me out please. There’s a great story I believe that comes through what we went through that can affect people and help you be successful in life. We had some people going through that on how positive my wife and I were that said we were being too positive, that they felt we weren’t in touch with reality. Let me first say, we were very in touch with reality. My son laying there in a bed lifeless on a breathing tube – if you don’t think I cry, then you’re nuts! That was the toughest thing I’ve ever gone through in my entire life. The reason we stood so positive is two things. First off, if you read the Bible the way I read it, it says that God’s grace is sufficient, but when you’re sitting there with your six-year-old who is not breathing on his own for 10 straight days and coming out of it another rough week and a half in the ICU, His grace is sufficient, but it is harder to grab hold off. The other side of that, the reason why we were positive, is because we were positive. We knew what we were going through; we knew what was going to happen on the other side. We believed in faith. I think the issue, and this is what I was getting to, this is the story that I believe is what helps us be successful, helped us be successful and will help you be successful in whatever you’re doing, whether it be something faith based or be business or relationship; it doesn’t matter! It’s the fact that we are also presented with two options in life. What I call option A, God’s best for your life, and option B, which is settling. In life, we come up with a decision – maybe it’s to start a new business, maybe it’s to go for a raise, maybe it’s to try a little bit harder in your job on in your business to go to the next level and bring more money to the table for you and your family, or it’s to take your relationship with your spouse of your friend to the next level by putting in a little more effort. Option A is that level. It’s moving to the next level and what I call God’s best for your life. Option B is what we settle for. You know why? Because we’re not always willing to stand in faith on option A. For us, option A was my son coming up; option B was burying my son in the ground and living without my son for the rest of my life. There was no option B for us! That’s why we were so positive. That’s why we looked like we weren’t in touch with reality – the reality I was in touch with was that my God gave me the faith, my God gave me the strength to be able to stand on His word. His word said to knock and keep on knocking. His word said that if I stand in faith, I can force His hand to go towards what I’m standing in faith in. What did we do? We stood in faith with the fact that my kid was coming home. There was no option B! That’s your issue. That’s why you’re not going to the next level – it’s because there is an option B! You need to sever option B! You need to act like option B means death. If you stand that strength in faith and you say that sounds difficult, yes it is! But that’s why so if you actually succeed on a big level, it’s because very few are willing to stand as if option B wasn’t even there! Forget option B. Forget not having God’s best for your life. Do whatever it takes to stand on option A and let God show fruit in your life that creates the most amazing life you’re supposed to live. You’re not supposed to settle. You were not designed to be average; you were designed to stand above the rest and do something amazing! It’s been planted in your heart, it’s been planted in your spirit, it’s in your mind, but there’s a war in your mind of option A and option B. Today, draw a line. No more option B. Sounds weird, I know, but it gets the point across. Act as if you were standing on that bedside, it’s 2 o’clock in the morning, it’s completely dark inside the room except for beeps and little lights going on, machines that are telling you whether your son’s doing well or not. Are you going to look at that? Are you going to look at the visual of what’s going on? Are you going to look at your situation, your relationship, your bank account, the way your business or job is going? Are you going to look at that as your faith level? I did and it was a tough night! Whenever I looked at the numbers to see if my son was doing well, that made it tough. When you forget about the numbers and do what faith is, living as though it were now even though you cannot see it, watch what happens! Watch things begin to change. Quit looking at these eyes and begin looking at the future. Begin looking with your spirit. Begin looking with your heart and what you were destined to be. As always, live life with Passion and Grit; passion, because without it, life is just boring, and sometimes you’ve got to grit your teeth and do whatever it takes to succeed because life is short and it’s time we stop just surviving it and start living it now.